The process of selecting a college or university can be stressful, especially when the decision is based more on intuition than evidence. Here is a series of questions to ask with resources for research. We’ll be updating this with your feedback! 1. What are your goals for college? Start by thinking about why you want to go to college. This 8-minute video has some ideas to consider. There are many reasons to go to college. Two of them are: to explore and follow your passions; and to prepare for a career. Since college costs are higher than ever before, career preparation is more important, too. The rest of these tips focus on exploring possible future careers to help you select a college. When you eventually start a career, you’ll discover there are certain kinds of work settings that are most engaging. Why not seek a career that provides the kind of environment you’ll love? To get started, you can answer a short questionnaire that will help you find out which of 6 different work environments you like best. Then, you can browse the occupations that match your preferred style. This survey will help you get some ideas about possible careers. You can also browse general career areas and dive down into each of them. If you want to dive into more specific careers, you can also take this 10 minute survey for recommendations. Deepest dive: The source of federal data about careers is called the Occupational Handbook. You can also browse all occupations being tracked by the federal government. These are just ideas to consider. You may or may not find careers that sound interesting … now. But, keeping a general list of the types of careers that interest you may plant the seed for future investigations. 3. What majors go with what career areas? 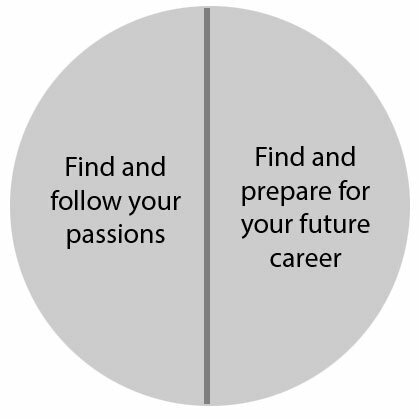 Once you have a career area in mind, you can find out which majors are best at preparing you for it. For some areas, specific majors are best. However, in many cases, broader skills — critical thinking, creative problem solving, team collaboration, and interpersonal communications — as well as your overall college experience are as important as your major. 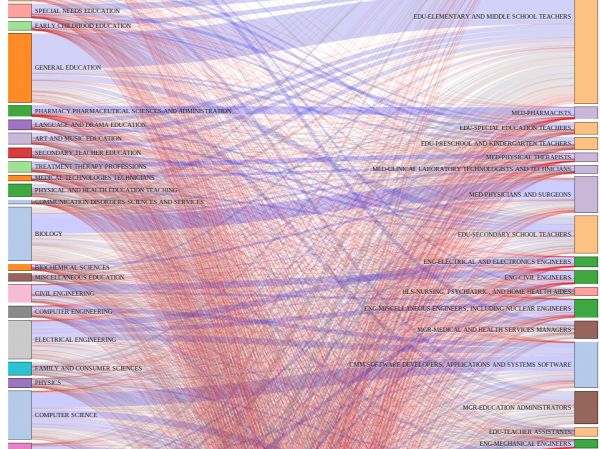 To see which majors go with which careers, based on national surveys, check out this interactive map. If you want to know more about how much each major pays a college graduate, see this interactive site. 4. What regions of the country interest you? When you’re in college, you may spend 4 years in one city or region, and you’ll have a chance to explore your interests and possible future careers there. You might want to consider going to college in a place that has a strong economy. Not only would that mean more well-paying jobs are available for after graduation, but people living there may have more disposable income so they might support more things you’re passionate about, such as music, theater, dance, social opportunities for people like you. 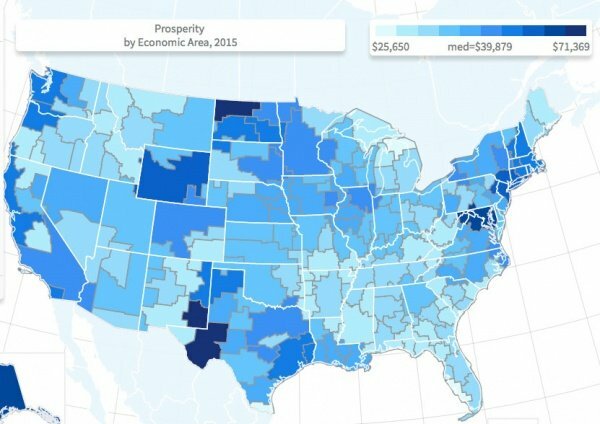 You can learn a lot more about regional prosperity at this website. 5. What colleges interest you? By now, you have enough information to search for colleges in regions that might be a good match for you. The College Board has an website called BigFuture that asks questions, posts articles by students and experts, and maintains an interactive search to filter possible colleges by type, location, majors, activities, and services. 6. Which of the colleges you like are good investments? College is expensive. How do you decide which colleges are worth the tuition you’ll pay? One way is to look at how long it takes a graduate to pay off their loans. Every college is different, so you can start by calculating how much you’ll actually pay at the colleges you like. Few students pay the full tuition price that is shown on their websites. To learn what you might pay for college tuition, you’ll want to search for the “Net Price Calculator” for each school. These are often managed by the College Board. To learn more, see these articles at the College Board website. Next, you might want to know more about which colleges are good investments, meaning how quickly alumni pay off their college loans. If so, visit this “Return on Investment” list at Payscale.com. Be sure to select “With Financial Aid” to filter the results. You can also search for each of the colleges that interest you. You can also find out what each colleges’ alumni earn. 7. Which college “feels” right for you? Now that you’ve narrowed down the many possibilities to your top choices, how do you find out which “feel” right? You can now research each school to get a better sense. For each good-fit college, to to College Confidential to learn what students and parents are asking and reporting. Look at the website for the departments of the majors and minors that interest you, such as theater or political science. Do the webpages mention student activities? What do alumni do after graduation? How many are employed, and in what kinds of jobs? How many go on to graduate school? What do you want to do after graduating? Write down the primary professors in those departments, then go to Rate My Professors and see what students think of those professors. 8. What should I do when I visit a college? Big Future from the College Board has recommendations for college visits. Keep exploring as you learn more, and send us your own story. What have you learned on your journey toward college?